I prefer to use manual lawn and garden tools whenever I can. Especially when it's a tool that doesn't get used frequently. Not worrying about oiling, gassing, tuning, the amount of space it takes up and how much it costs are some of the benefits. One drawback however is that I'm fairly tall and a lot of tools seem to be designed for people shorter than me. While I actually enjoy the exercise I get, sometimes my back tires out before the rest of my body. That little bit of extra bending I might have to do can really slow me down. Ames True Temper, who recently bought Hound Dog Products, have released a new version of the popular Weed Hound called the Weed Hound Elite. One of the big differences is the new Weed Hound Elite is now 3" taller. Those extra 3 inches make it more comfortable to use by reducing the amount I have to bend over when using the Weed Hound Elite. Another new and noticeable feature is the lack of a plunger on the top. To release the weed after pulling it with the new Weed Hound Elite, you use the slide handle on the shaft. This gives you a little better control of the Weed Hound if you're trying to eject the weed in a small pail or bag but I feel the old plunger was easier to use, especially if you really needed to apply a lot of force to eject the weed. Other new features include a non skid rubber cover on the step plate and a foam rubber grip on the handle. Both of which make the new Weed Hound Elite easier and more comfortable to use. The new Weed Hound Elite works in a similar way to the old Weed Hound. Just position the prongs centered over the weed, step down on the foot step to drive it into the soil, twist and pull. The new Weed Hound Elite also features a twisting action in the prongs. This reduces the size of the divot when pulling weeds. 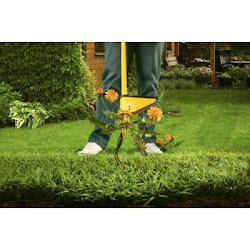 This is great for weeds with a tap root such as dandelions but may leave some of the root behind for weeds that have a fibrous root system such as crabgrass and tall fescue. For that reason you may want to stick with the older model Weed Hound if the extra height isn't as important to you, it's also $5 cheaper. In local stores you're likely to only find the newer Weed Hound Elite but you can still get the older Weed Hound from Amazon and it includes free super saver shipping.